You finally installed a wooden fence to provide for privacy for your whole family, but now you have to keep it looking new. Wooden fences require regular maintenance to prevent it from damage against the weather elements like rain or wind. Although summer is coming to an end, the heat at the beginning of fall can be taxing on a wooden fence. 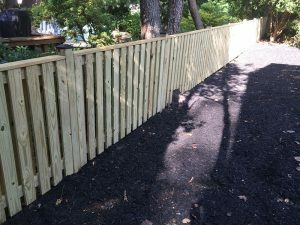 So, it crucial to take proper care of your fence so it can continue looking beautiful for your family and guests to enjoy. Regardless if you want to paint your wooden fence, it is crucial to seal your fence to protect it from the elements. Staining your fence can give it a painted look while still keeping it natural looking. If you do want to stain your fence, you should seal before to maintain the stain look for years to come. How often you seal your fence depends on the weather of the region you live in and will need to be sealed more if you live in a rainy area. A good way to check if your wood needs sealant is if water doesn’t bead off of the fence and it just soaks into it. One of the biggest problems with wooden fences is that mildew tends to build up on the panels. So, it is important to regularly clean your fence with a mildew clean or soap and water will work just fine as well. Cleaning your fence and getting rid of any dirt will extend the life of it so your family can continue to enjoy it. One of the dangers of having a wooden fence is that it might fall victim to termites and will to pay for costly repairs. Luckily, there are easy ways to prevent termites from rotting and destroying your fence. Termites live in moist soil, so they eat softwoods that are buried where they live. All you have to do is dig you wooden posts out of the soil and expose them to the air. So if you remove your fence from the termite’s habitat, they will not destroy your fence. Simple as that! This entry was posted on Friday, August 18th, 2017 at 2:40 pm. Both comments and pings are currently closed.